You know what type of cookware is my absolute favorite? Well, okay to be honest I have a few but there’s one type that just stands out to me beyond all the others, living in the South there’s nothing quite like preparing a delicious Southern style meal for my family than using cast iron cookware! You also know what really, really stinks? When that cookware rusts! Talk about being really upset. 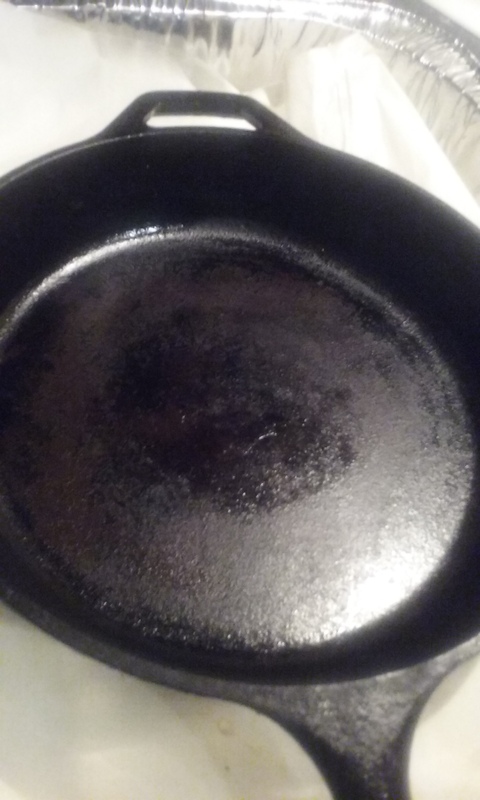 Well, I was actually given a beautiful cast iron skillet my Daddy gave this one to me to use and I was so excited but, it was rusted pretty bad. I did my research and decided to finally give what appeared to me the best way a good try, and oh goodness am I glad I did! So, you may be wondering what I had to do, probably thinking that it took me forever and a ton of money in products to do so because well, to get cast iron back to a good state isn’t easy or cheap right? WRONG! I’m so happy to say that’s wrong! Want to know what I used? Yup, that’s it, salt and a sliced potato. Want to know what else, I figured I would be investing probably an hour or more into this project until it was finally looking good. Well, it took me all of 18 minutes from start to finish! The steps are so simple, fill the bottom of your cast iron cookware with some salt (no more that 1/4C.) add in a few teaspoons of water, slice your potato in half and get to scrubbing. That’s it! You may have to add in some more salt occasionally but that’s all. Once it looks good and you’ve removed all the rust rinse it off and re-season. **To re-season just rub your cast iron down with lard set your oven to 375 F, place it in a deep pan upside down (to catch the excess oil) and heat it for 1 hour, after the hour turn the oven off and let the cast iron cookware cool down in the oven. To watch this process be done by me check out my video and you’ll be ready to fix and re-season your own cast iron cookware! Just Click Here! This entry was posted in Being Resourceful, Cleaning.